First Class shipment outside the USA normally takes about 14 business days. Delivery times can take as long as 4-6 weeks. Shipping Times Vary: Shipping estimates may vary based on mail volume, local conditions, work stoppages, customs delays, and other factors that are out of our control. These estimates are approximate delivery times and not guarantees. If you required a guarantee, ask us about UPS Worldwide Expedited or Worldwide Express shipping. Import Duty and Tax Disclaimer: Import duties, taxes, and related fees and charges are not included in the item price or shipping charges. These charges are the buyer's responsibility. Please check with your country's customs office to determine what these additional costs will be prior to bidding/buying. No Gifts Policy: We are a business and it is against the law for us to ship items as gifts, so please do not ask us to do so. All customs documentation will show the price you paid for the item. Please do not ask us to commit fraud by reporting a lower cost or gift. Upgrade or change your shipping service to speed delivery. 30-Day Return Policy - Just be sure the item is in new, re-saleable condition and in its original packaging. For example, your item is shipped in a plastic bag or box with an inventory tag (and then in bubble wrap and a mailer or box), you must return that plastic bag or box with inventory label with the item inside. You can return the item in its bag or box in the original mailer or box or in any appropriate mailer or box with enough bubble wrap to ensure the items safe return. No RMA number needed - Don't like it or doesn't fit? Simply return it with a copy of the invoice to the address listed at the top of the invoice. No need to call or email us for a return authorization. Fast processing - We process most returns and exchanges within two business days of receipt so you can quickly get your replacement item or money back. 20 percent restocking fee - All items returned without the original plastic bag with tag are subject to a 20% restocking fee. Shipping - Shipping, including return shipping, is the responsibility of the buyer. You are returned the purchase price of the item (no shipping). One Year Watchband Guarantee – AJ Raefields offers a one year watchband guarantee. 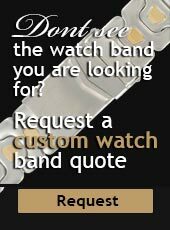 If there are any problems with your watch band within one year from purchase date, we will gladly replace the band with the same band or a similar band of equal value (at our discretion). Replacements not to exceed 3 within 1 year unless a covered manufacture’s defect. Did we make a mistake? It was not intentional. If you need to make a return because we sent you an item, color or size that you did not order, please contact us and one of our customer service people will correct the problem.